Perhaps not as entertaining as Adam Savage’s dirty word list, our lists or indices have plenty of ‘purchase.’ Our lists focus on companies that offer energy alternatives to fossil fuels - solar, wind, geothermal and various biofuels. Not to be hemmed in by conventional categorization, we have also included companies with technology to use energy more efficiently or to re-purpose materials for better deployment in energy applications. These trailblazers have provided excellent investment opportunities for investors willing to take a chance on new technologies. The annual update of Crystal Equity Research’s Energy Alternatives indices has been completed. Merger, bankruptcies and just plain old ‘tossing in the towel’ actions took a number of companies out of our broadly defined sector of energy alternatives. Undeterred by start-up risks, entrepreneurs and inventors have been busy bringing new technologies and solutions to the market. Thus, as doors closed, windows of opportunity opened elsewhere. The Energy Alternatives indices still encompass over 750 public and private companies, all of which present interesting investment choices for the shrewd investor. At the beach there is plenty of sun, the single most important source of energy for planet Earth. After all fossil fuel is simply the sun’s energy trapped by photosynthesis in leaves that were left to rot for many, many years. Renewable alternatives to coal, oil and gas are just trying to tap energy from the sun in real time. No longer in playing with the beach boys is Algae Tec (AEB: ASX), which has left the biofuels arena in favor of an algae-based nutraceutical product line. Good luck to them. Solazyme had tried the same maneuver, changing its name to TerraVia in the process. Unfortunately, as a nutritional products concern TerraVia was not mean to be and was forced into bankruptcy. There are a string of other algae developers who began with visions of fuel and had to divert to other products. Solix is now making astaxanthin. Sapphire Energy is marketing animal feed ingredients. Algae-based fuel developer OriginOil is also still in business but also has a new name as OriginClear (OCLN: OTC/BB) as the company repurposed its algae to decontaminating water. Exploitation of algae is clearly a difficult business. However, biofuels have proven challenging as well. Several aspirants were eliminated from the Algae Group in the Beach Boys Index - five because they are keeping such a low profiles there is no telephone number or website contacts. As tough as the road might seem for biofuels, we added new contenders to the group. Verbio Verenginiate BioEnergies trades on the Germany exchange under the symbol VBK. For those looking for BIOX Corporation or World Energy Alternatives, they have been reclassified in the biodiesel group. Unfortunately, development of alternative chemicals proved equally demanding. BioAmber was forced to liquidate its assets for production of bio-based succinic acid. The company’s succinic acid production plant was bought by Visolis, Inc., which has been added to the Alternative Chemicals Group. Another bio-chemcial aspirant, Visolis declared its intentions to produce other higher-valued added bio-chemicals at the plant in addition to renewable succinic acid. Verdezyne was also forced into liquidation despite management’s valiant effort to open operations in early 2018. The fate is unknown for its Malaysia or California assets where Verdezyne planned to produce it renewable chemical - dodecanedioic acid. 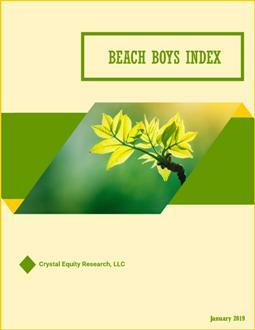 Waste-to-energy producers are included in the Beach Boys Index, because many of rely on various methods to extract residual solar energy from waste. Added to the WTE Group: Advanced Disposal Services (ADSW: Nasdaq), Rubicon Global (private) and Recology (private). Visit the Crystal Equity Research website to view the updated Beach Boys Index. More in the coming posts on revisions to the other three indices: Electric Earth, The Atomics and Mothers of Invention.